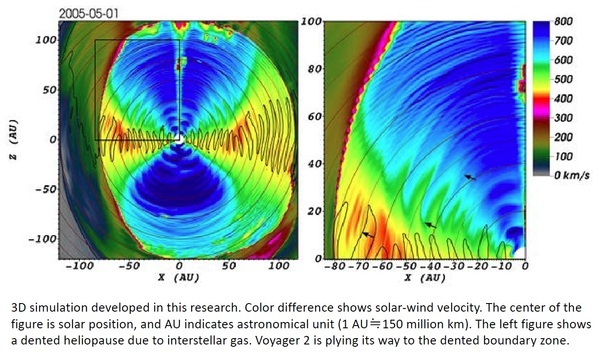 Professor Munetoshi Tokumaru at the Solar-Terrestrial Environment Laboratory, Nagoya University, and his co-researchers have realized accurate 3D simulation of a heliospheric structure by using long-term observation data of solar wind. Their paper was published online in Geophysical Research Letters on February 24, 2014. The solar wind creates the heliosphere, which blocks interstellar gas and harmful galactic cosmic rays. The boundary between the heliosphere and interstellar space is known as the heliopause, in which interstellar gas and solar winds collide, causing turbulence (Figure 1). The condition of the heliopause is similar to that of a boundary in which two water flows meet, resulting in continuous change. The current solar wind is the weakest in recorded history, and more galactic cosmic rays than ever are beaming down on Earth. Understanding the flow of the solar wind and the structure of the heliosphere is important in predicting changes in the space environment in addition to their impacts on Earth. The Solar-Terrestrial Environment Laboratory, Nagoya University, has observed the solar wind over a long period of time and has led global research on the heliosphere. Recently, Professor Tokumaru's research group succeeded in realizing an accurate magnetohydrodynamics simulation of the heliosphere by using magnetic field and solar wind data. 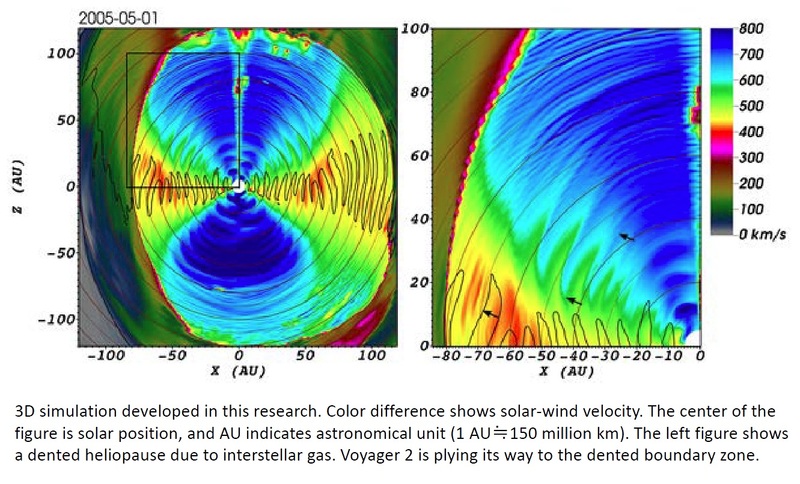 As shown in Figure 3, this system can duplicate the solar wind blown from the entire globe of the sun in addition to complex structural changes in the heliosphere. 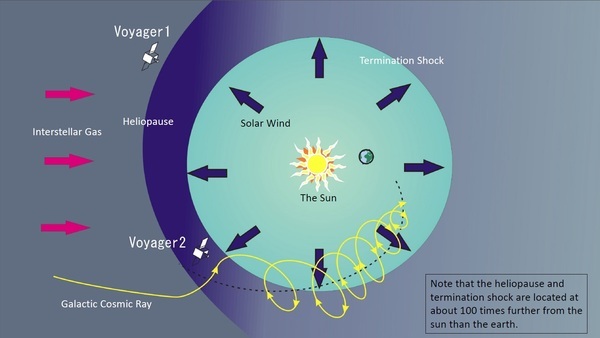 This research is the first to capture flickering in the heliopause and wavy solar wind structures in the heliosphere in simulation, although Voyager spacecraft previously reported the presence of these features. The simulation system can predict the time at which Voyager 2 leaves the heliosphere with accuracy by calculating changes in the heliopause. The research outcome will contribute to improve space weather forecasts and to accelerate research on the boundary region between the heliosphere and interstellar space. 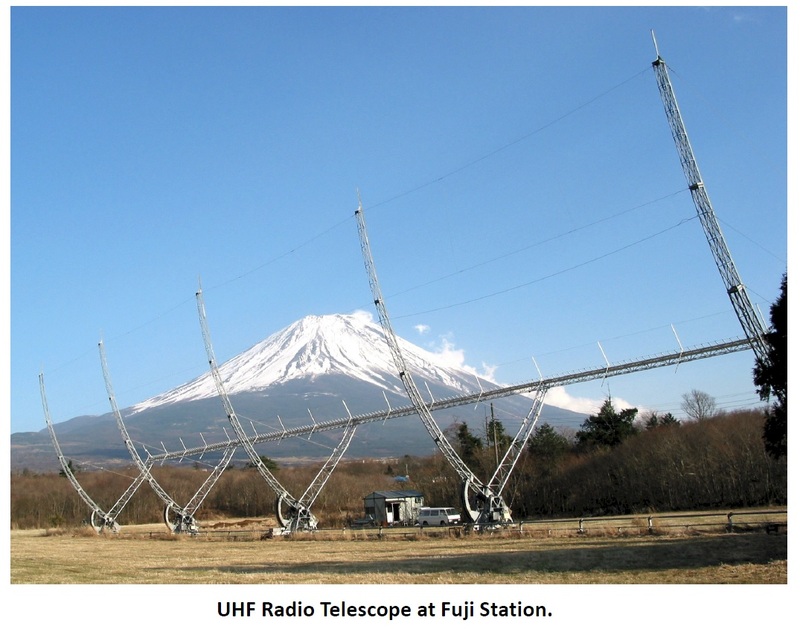 Professor Munetoshi Tokumaru took part in Jovian radio observation as a graduate student at Tohoku University. After graduation, he worked at Radio Research Laboratory, the Ministry of Posts and Telecommunications (current National Institute of Information and Communication Technology), in the space weather forecast program. During his tenure, he realized the importance of solar wind research and developed a strong desire to challenge mysteries behind the solar wind and find its influence on the space environment. He chose to research this subject at Nagoya University because it was the only research institute that had observed the solar wind in the long term. Currently, he explores the space environment that can directly influence our lives while seeking physical knowledge on space at the Solar-Terrestrial Environment Laboratory, Nagoya University. "Since Voyager 1 entered interstellar space, it has provided us with previously unknown facts about space. At the same time, new mysteries have accompanied this new knowledge. We live in unique times with solar activities unprecedentedly weak in last 100 years, and researching the heliosphere in such times is exciting and epochal. I would like to take this huge opportunity to contribute internationally to deepening the knowledge of the heliosphere by using observational data acquired in Japan." "When I was a child, I was intrigued by Apollo 11's lunar exploration and studied solar-terrestrial physics (STP) in college. Currently, I conduct research on STP at Nagoya University. However, I have worked on researches in many different fields before joining our laboratory, and I never imagined being a STP researcher in the past. Through twists and turns, I acquired various skills and knowledge, which have greatly helped my current research. I hope you gain a range of knowledge from a variety of experiences too."